One term down, three more to go. For Hadley, that is. You’d better believe the middle school countdown is on because we’ve all hated the last 10 months (minus summer break). I’m not sure what it is about this age for girls but it is brutal beyond what I ever could have imagined. Bode is fine. He’s doing great in all of his classes and does the monthly “math bus” where he goes to the high school for more challenging math opportunities. He made the honor roll and commemorated it by handing me this. My friend suggested I frame it as-is. I think she may be onto something. Part of my frustration with traditional public schools is they just don’t fit the mold for everyone. If you’re a linear learner like Bode, you excel. If you’re an experiential, artistic person, you just feel stupid. It doesn’t help the middle school doesn’t have any extracurriculars or any teachers who go above-and-beyond to help. When you struggle in elementary school, your teacher works through it with you because you have an established relationship; in middle school, you’re hung out to dry. Some kids adapt quickly to this new paradigm while many fall short. Hadley has zero motivation until the end-of-term when the heat is on and then can generally pull off reasonable grades. How do you motivate the unmotivatable? “It’s too hard.” She hates her classes so it’s easy just not to care. If it was only school, that would be one thing but she lacks motivation in most areas in her life and we’re really struggling to find something she’s passionate about. Even for volleyball, which she enjoyed playing last year, she told us if she doesn’t make the competitive team (which she has zero motivation to practice for tryouts), she’s prepared just to drop it altogether. I guess if there’s any age where you’re going to struggle with figuring out life, 13 years old is the time to do it. But what if you don’t emerge unscathed? She is such an amazingly strong spirit, so stubborn but full of so much power. She’s a leader and makes things happen (but only when she wants to). She’s fun, she’s hilarious, she creates beauty in so many forms and when she figures out how to harness the gifts and talents she’s been given, she will be unstoppable. 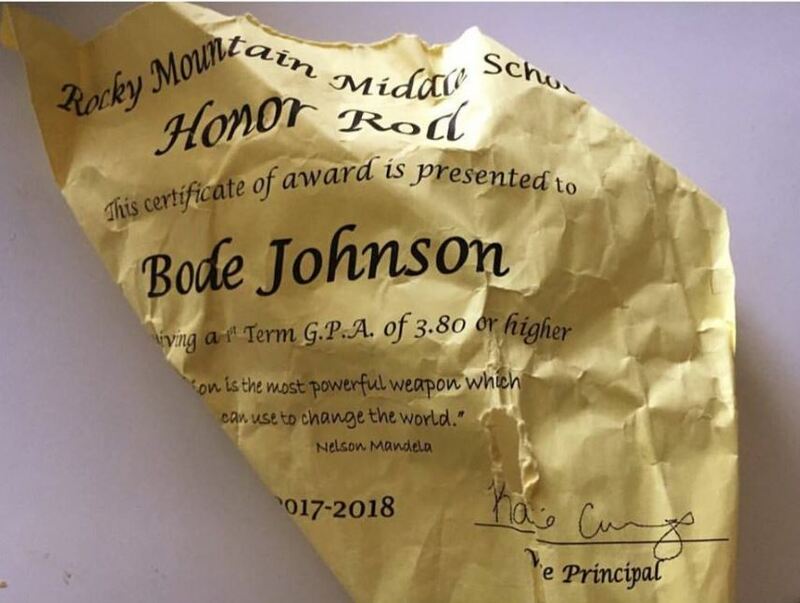 When we first moved to Utah, she was on fire and landed on the honor roll her first term, proving she can do anything when she puts her mind to it. Bode cares deeply about people and as a peacemaker, hates contention. Over the weekend, we went shopping for Hadley’s ski jacket. We tried a few second-hand stores and of course, the only coat she liked was a full-priced one at REI, blowing most of her Christmas budget. If we were to compare the amount of money we spend on her vs. low-maintenance Bode, there would be no comparison so I bought him a cool hat for school. Hadley immediately fell in love with it but I was firm that it was Bode’s and she didn’t argue after all the money we’d just dropped on her. Last night as we gathered for family prayer, he casually mentioned that she had been bugging him to borrow her hat so he bribed her. I was surprised because he’s not really the bribery type and plus, what does she have that he wants? That sweet kid. Maybe I’ll turn over all parental duties to him. Sending out a Mom Blog S.O.S. Spring Snow Day in Colorado!